Our aim is to make your boating experience as easy and enjoyable as possible whether you are a competitive racer, motor cruiser, commercial boat owner or family sailor. Flexible berthing, with annual, winter, summer and visitor options. We offer a flexible approach to berthing. Choose from four prestigious coastal marinas in Cardiff, Burry Port, Aberystwyth & Port Dinorwic. We believe that providing first class facilities and friendly, professional staff is essential to operating a successful marina. Boat owners benefit from a wide range of specialist services. We run extensive boatyard services from our workshops in Cardiff, with additional services in Swansea, Burry Port, Aberystwyth & Port Dinorwic. Boat owners benefit from a wide range of specialist services and a mobile team of engineers. Our drystack system in Cardiff provides 110 spaces for RIBs and motorboats up to 30’ and is an increasingly popular system for boat storage. Think of drystack as valet parking for your boat! As a company, we own and operate several marinas giving us first hand experience and an in-depth understanding of the requirements of dredging operations. As part of our service we can offer advice and support throughout a dredging project. We own and operate a number of offices, retail spaces and workshops in prime marine locations in Cardiff, Swansea, Aberystwyth & Port Dinorwic. We have hard standing storage available in our marinas for yachts, motor boats, trailers and masts. With a pro-active marketing approach and a team of qualified boat brokers, we provide a professional, informative service to help guide buyers and sellers through the process. 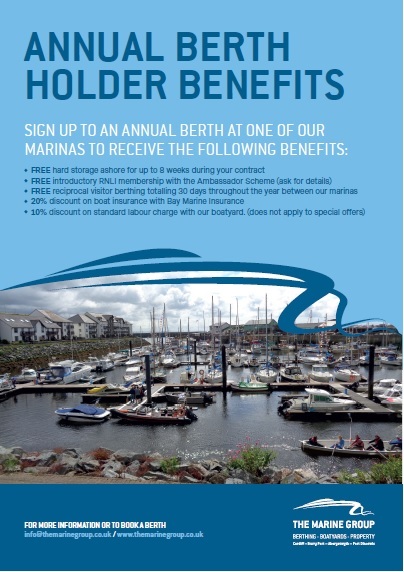 As an annual berth holder at one of our marinas benefit from discounted visitor berthing in our visitor network. Our approach is to offer an integrated marine business that ensures you get the most out of your boat by offering you access to a wide variety of complementary services.